Sometimes it’s fun to be a tourist in your own city. 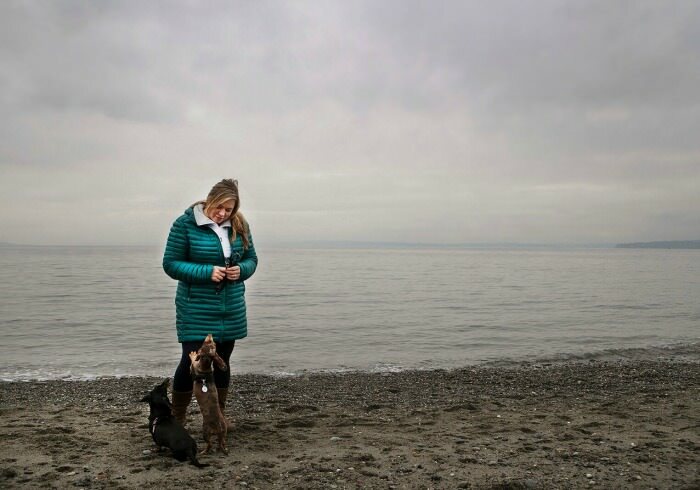 A few months ago, I visited some of the best dog friendly attractions in Seattle with Chester and Gretel. While I have a gazillion (almost an exact figure. Ha, ha.) photos of Chester and Gretel, I don’t have many of us together. I decided to partner with local Seattle pet photographer – Julie Austin Photography – to follow us around and capture some memories of us. I think all of the pictures turned out great. However, this one is my favorite. There are two reasons why. I’ve grown up in the northwest all of my life and practically lived at the beach when I was a kid. The beach is a very special place to me. This photo captures the quintessential “Puget Sound Beach” – clouds and all… you know… because it’s cloudy and rainy here a lot. But I also love it because I don’t hate it. That may sound silly but I don’t like pictures of myself. Almost ever. I mean, who does really? Well, I actually love this picture of me with Chester and Gretel! Julie really came through on her promise to “capture your special relationship” with your dog and she made me look good! Julie was really laid back and easy to work with. 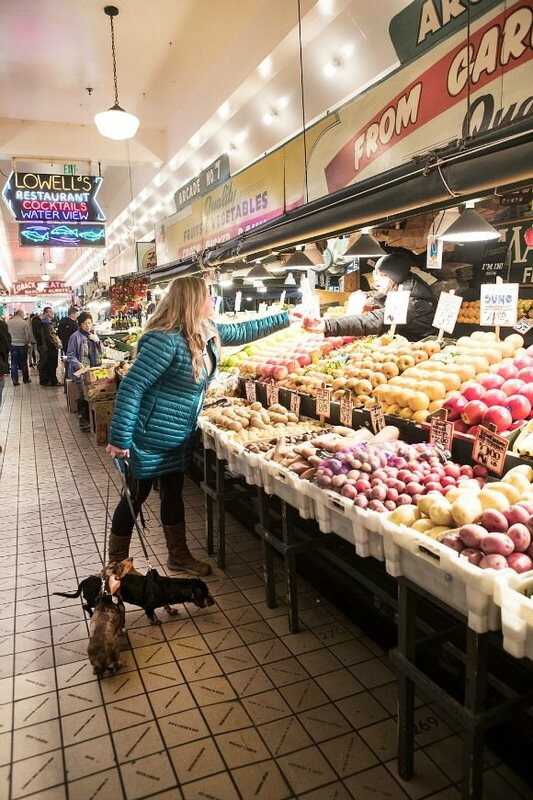 She was patient when Chester and Gretel didn’t want to cooperate (like when they were only interested in the crumbs on the floor of the Pike Place Market). Although we wanted to get some important “iconic Seattle” photos, she gave me direction without making me feel like I had to be the perfect model. She made suggestions and just kind of let me do my thing. And speaking of iconic Seattle photos – I got to choose the location(s). She didn’t have a standard go-to location list I had to choose from like some pet photographers do. I got to choose places that had meaning to me instead. I would definitely work with Julie again. In fact, now that it’s clear Chester is getting old, I feel like my time with him is limited. I want some updated pictures of him as a senior – but still relatively active and healthy – that will bring a smile to my face when I look at them. 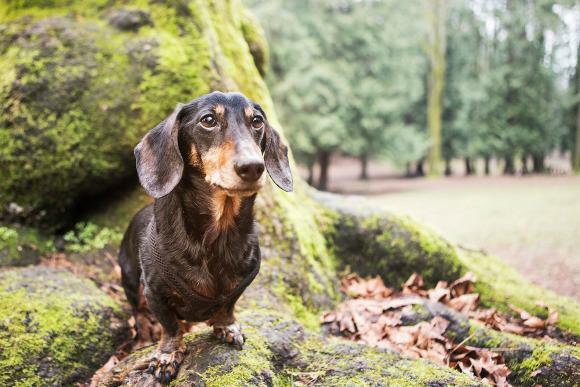 What makes Julie different than some other Seattle pet photographers? She’s as obsessive about her pets as you: All of her dogs have middle names. She can never sell her car because she’ll never ever get the dog smell out. Her dogs have better health insurance than she does. She captures the soul of your special relationship: You’ve got a zillion pictures of your pet on your camera phone, or even your own digital camera. But seldom do any include you, or that capture your special relationship. Most pet photographers will only take photos of your pets but she will include you as much as you want for no extra charge. For every 1 hour of photos she shoots, she does 3 hours of edits. This artisan attention to detail is what makes the windows to you and your pets soul pounce off the image, and avoid over editing disasters most others make. She was voted Evening Magazine’s “The Best of Western Washington” Best Pet Photographer in 2012, 2013, 2014, 2015 & 2016! Whether you are looking for celebration of life photo of your beloved pet, or you are traveling to Seattle with your dog (or cat or horse), and want a professional to capture your special bond, contact Julie for one of her Mini Photo Sessionsor Private Photo Sessions. You can also check out her work, and get to know her better, by following her on Facebook or Instagram. Ooooh food shopping with the dogs! LOVE! You know…? I might need to do this. I have photos from all our amazing travels but nothing from HOME. What a great idea! How funny, I just posted about our experience getting professional pictures taken too. And yes, it’s amazing to find that great, dog-loving photographer who works to express the relationships we enjoy with our dogs. I love the pic on the beach too. It’s lovely. I just read your post. So cool that you were able to meet up with Beth’s sister. The pictures turned out great.